SPCR • View topic - Any Intel 7-series mITX boards w/DC in? Any Intel 7-series mITX boards w/DC in? Post subject: Any Intel 7-series mITX boards w/DC in? I am essentially looking for the DH61AG's replacement. I plan to upgrade my HTPC to Ivy bridge before the end of the year. Applications include everything except for gaming. I use a networked HDHomeRun tuner. I will be starting from scratch, moving from mATX to mITX, from a dedicated GPU to integrated, from an ATX PSU to a Pico (or onboard DC-DC), all in a much smaller case. This upgrade is motivated mainly by a desire for faster CPU performance (video encoding), and a smaller physical footprint than my NSK2400. Power consumption is secondary, though this will certainly improve. I have not settled on a case yet. I may make my own since I can't find anything that satisfies all my needs/wants. The HDPlex H5.ODD is almost perfect. What I end up with will resemble it. The build will include a full-size optical drive - my trusty LG HD-DVD/BD combo - plus a slow 2.5" storage drive and a mSATA SSD, most likely one of Micron's new C400 mSATA SSDs. For the sake of elegance, I am interested in keeping internal component & cable count to a minimum. This is one reason I want the mSATA SSD. The other reason is that I also need to power the storage HDD and an optical drive. To power all this with a PicoPSU will require at least an adapter, and most likely cable extensions as the Pico's cables are pretty short (at least, all of mine are). So, I want a motherboard with mSATA support from its mini PCIe slot. 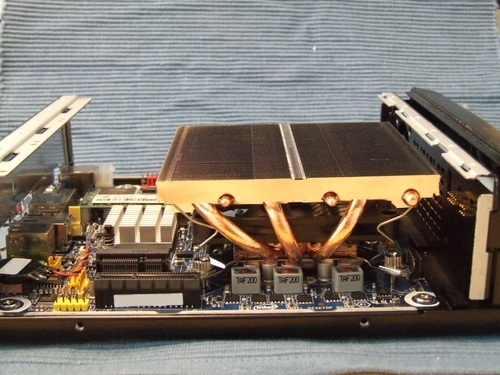 Several Intel boards support this, including the approximately 1-year old Intel DH61AG. Does anyone know if the DH61AG will support Ivy Bridge? I cannot find anything official. Another advantage of the DH61AG is that it includes a SATA power cable that can power 2 SATA devices directly from the motherboard. I like this a lot. But of those, only the DH61AG interests me (DN2800MT is Atom, and the rest are not mITX). But that list needs updating, since their soon-to-be-released DH77DF reports mSATA support. I read a rumor online (here maybe? I can't find it anymore) that Intel is prepping a 7-series chipset Slim mITX board. I am thinking that it would be the replacement for the DH61AG. That's what I want anyway: a 7-series mITX board with built-in DC-DC conversion, support for mSATA on mini PCIe, and SATA power out on-board. Is this too much to ask ?! Post subject: Re: Any Intel 7-series mITX boards w/DC in? The DH61AG should in theory support Ivy Bridge. If you can wait a bit check Intel's processor compatibility list after Ivy Bridge officially comes out. There was a CPU support update in the Dec6 BIOS update, but it doesn't say exactly which CPUs were added. The board You looking for is a DQ77KB. Layout is identical as DH61AG. DH61AG will get bios upgrade to support ivy bridge cpu's . H61 chipset will remain as a low budget option through 2012 so bios update is almost 100% certain. DH61AG will get bios upgrade to support ivy bridge cpu's . H61 chipset will remain as a low budget option through 2012 so bios update is almost 100% certain. The board You looking for is a DQ77KB. Layout is identical as DH61AG. Ah - thank you! Based on the few photos of the DQ77KB online, it's not identical but it is very close. Interesting that Intel is marketing this under the "Executive Series" (Q77 chipset) vs the "Media Series". Hopefully the DQ77KB will retain the HTPC and CIR headers. Based on the only hi-res photo I could find online, it does NOT. Both are 7-pin (8 position, 7 pin) headers, and I do not see them on the DQ77KB. Getting closer to buying the DH61AG. I am thinking that, even if I do not end up liking it in my main HTPC, it would make a great "set-top box" in a M350. A Celeron G530 + XBMC/Openelec on a USB drive, VESA mounted to the back of my living room TV ... would make a pretty neat streamer. Apart from the missing CIR header there`s another thing I don`t like about the DQ77KB: some of the voltage regulating transistors are located on the underside of the pcb. Granted, this will be a non issue for many but it`s a regression nevertheless. With temperatures over here exceeding 35 c in summer I think I`ll go for the DH61AG. @ntavlas -- By the way, I bookmarked your "HTPC in a CD player case" a long time ago. Fantastic work. I actually sought (and found) a broken Pioneer Premier DVD player, to emulate your build. But as soon as I opened the case it was clear that it would be much more work than anticipated. It had a case-within-a-case chassis, and the arrangement of VFD and DVD tray was wrong/inconvenient. A very well-made piece of hardware, though (copper screws?!). Oh yes, those copper screws! I still have them in a box somewhere.. I`m really fond of the Pioneer HTPC build but I think it`s time for a replacement (though in reality I`m just looking for an excuse to put one of my mini itx cases to good use). It seems our planned builds are quite similar, I`ve been considering the M4 msata ssd too. Personally, I think it`s worth waiting for even if that means using a 2.5' drive for a while. It`s a fast, proven design. I recon it`s going to be the best msata drive for some time, once it comes out. Maybe you could find some thick thermal foam pads and thermally couple the "underside" VRMs to the motherboard tray? Might alleviate any concerns you have . Even if you had to stack thermal pads it'd still be enough for something as heavy duty as a VRM. Yes, I would do that, but in my case the m/b tray is plastic. You might remember the white nettop I did, it`s a variation of this. I could build a new tray out of aluminium though. I`ve been considering the M4 msata ssd too. Personally, I think it`s worth waiting for even if that means using a 2.5' drive for a while. It`s a fast, proven design. I recon it`s going to be the best msata drive for some time, once it comes out. I think you're right. I just hope Crucial releases their version soon. Yet, it seems mSATA is the new darling of the SSD world, what with Intel pushing/promoting ultra books. This should bring more participants. Review methodology seems OK at first glance. In any case, there are more mSATA options that I thought (though some of the reviewed drives are not available retail). Another board, but I guess you need more SATA ports. 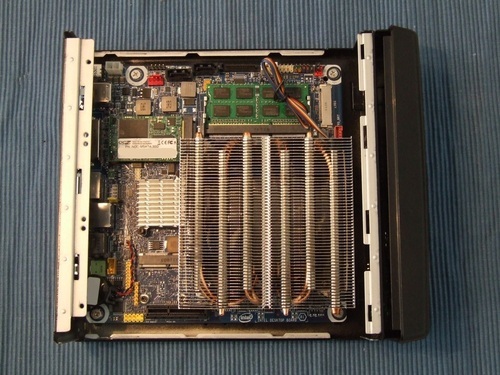 There are a bunch of thin ITX designs out there. Retail availability is another story. BIOS version 0039 includes support for future 22nm processors. So, it seems it's already "ready" for Ivy Bridge. I should have looked for this before asking. Intel wrote: BIOS version 0039 includes support for future 22nm processors. Not necessarily. I followed the links through on the Intel DH61AG site, and HERE I discovered that it depends on the board AA# as well as the BIOS version. Ivybridge requires an AAG23736-503 or later, and I have AAG23736-500, which will not support 22nm whatever the BIOS version. This is rather annoying for me, having discovered that Ivybridge processors are cheaper than their Sandybridge equivalents. Ivybridge requires an AAG23736-503 or later, and I have AAG23736-500, which will not support 22nm whatever the BIOS version. This is rather annoying for me, having discovered that Ivybridge processors are cheaper than their Sandybridge equivalents. Check Table 1 on the page you linked again. It states that all DH61AG AA#s are 22nm capable. It's possible you might need an old CPU to update the BIOS before plugging in a new one. Even if you don't, I'd keep the old CPU around until the replacement is delivered. In case your replacement doesn't work, you'll be able to know for sure what the problem is.